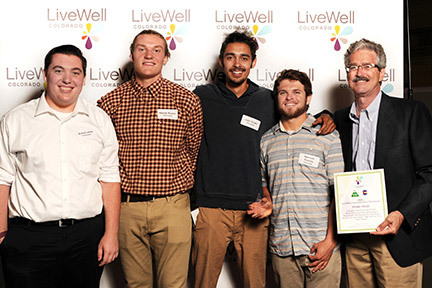 PUEBLO – CSU-Pueblo A team of student filmmakers from Colorado State University-Pueblo took third place in the LiveWell Colorado Film Challenge, a new statewide competition for short films on the importance of ensuring access to healthy eating and active living. At a public screening and awards event on August 18, emceed by CBS-4 Weekend Anchor and Health Reporter Kathy Walsh, the team of senior mass communication majors Spencer Daniels, (Saugus, Calif.), Kieren Kuiper, (Anchorage, AK), Avery Lewis, (Rye), and Josh Smith, (Colorado Springs), placed third for their film, Taking Life Into Your Own Hands. Student filmmakers were asked to produce a compelling one- to three-minute film of any genre. Finalists were selected by a panel of judges representing the film industry, health advocacy, and civic leaders. Judges screened and rated the films based on effectiveness in illustrating how a health barrier impacts people, persuasiveness in driving action, and resourcefulness in production. The CSU-Pueblo Team took home a $1,000 cash prize (split between the team members) plus $500 for the University’s Mass Communications Department. "We are very proud of the quality of work produced by the students, all of whom were enrolled last spring in the Advanced Digital Video class taught by Assistant Professor Jiaxi Shen,” said Mass Communications Professor Dr. Sam Ebersole. Front Range Community College student Sunflower Matzen placed first with his entry, My Mom Loves Colorado. Second prize went to Colorado Mesa State University recent graduate Bronson Henriques who wrote, directed, and produced Bridging the Gap. “This was a tough challenge for the young filmmakers: to produce a compelling short film that could entertain, inform, and encourage action on a complex subject – barriers to healthy eating and physical activity. It was an inspiration to see the quality of the films and the reactions of the judges and audience,” said Shepard Nevel, LiveWell Colorado President and CEO.